Hello and welcome to the Styled and Set Holiday Entertaining Blog Tour! 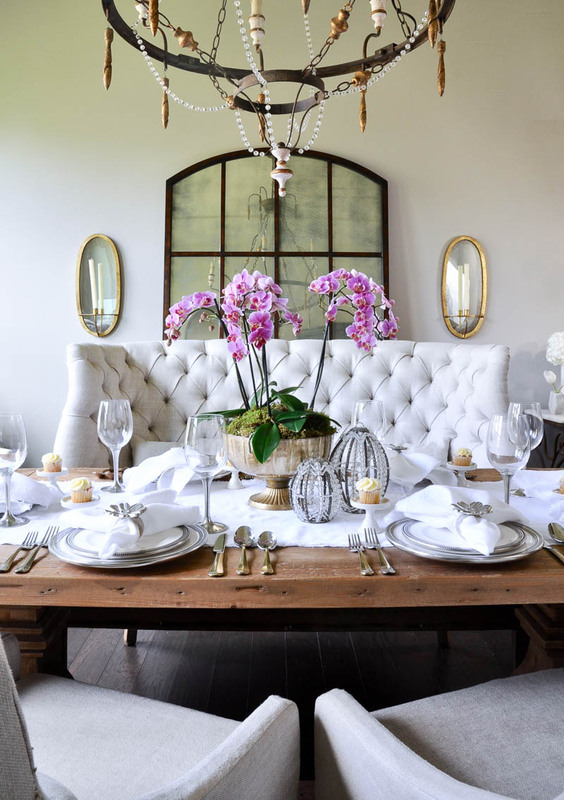 Today, I’m excited to be sharing a bit of inspiration for Easter entertaining along with several of my talented friends. 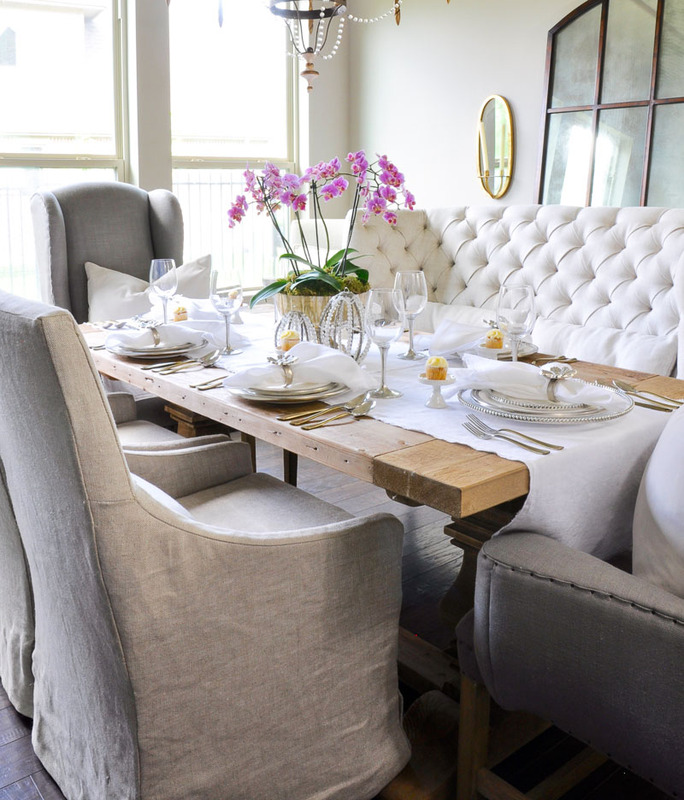 Our tour is hosted by Lory from Designthusiasm and she has gathered bloggers to share entertaining ideas with you each day this week. You can find the entire list of participants at the end of this post. If you’ve come from StoneGable, a special welcome to you! 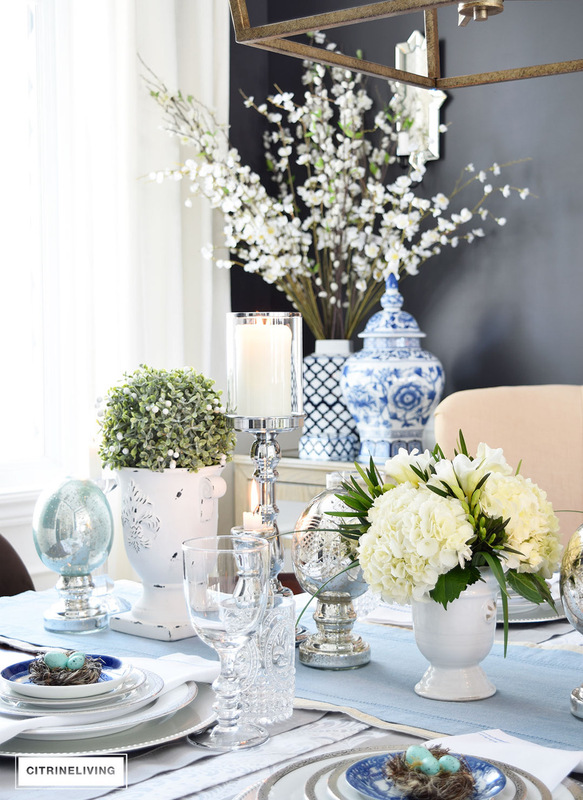 I love Yvonne’s black and white Easter table. She always offers such unique ideas. Now, I’d like to invite you into my dining room. 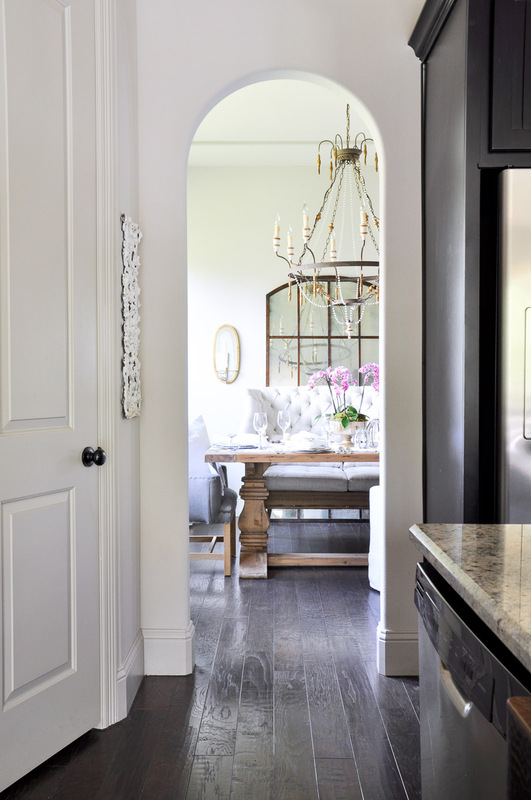 When I entertain, I like to consider the view from the kitchen towards the other rooms in the home. The kitchen is the place where we tend to gather. 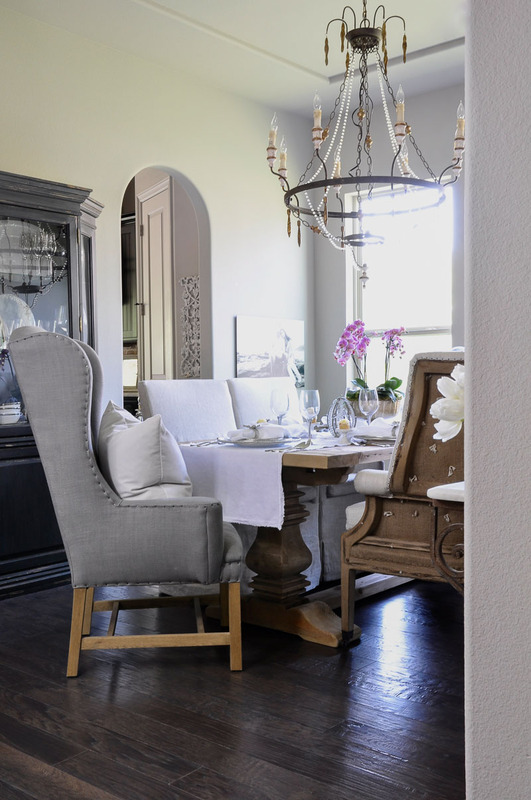 Therefore, it should always be one of the first rooms decorated with seasonal and holiday decor. * Affiliate links are included in this post. These links provide a small commission to this website, but add no additional cost to your purchase. From this view, you can see my centerpiece, which is typically my starting point for my holiday tables. This arrangement was easily assembled using orchids from my local garden center. I shared a “how-to” with you all in this post. My table is predominantly white and silver, but I love how my brass pedestal bowl (similar) and new flatware provide a touch of elegance. 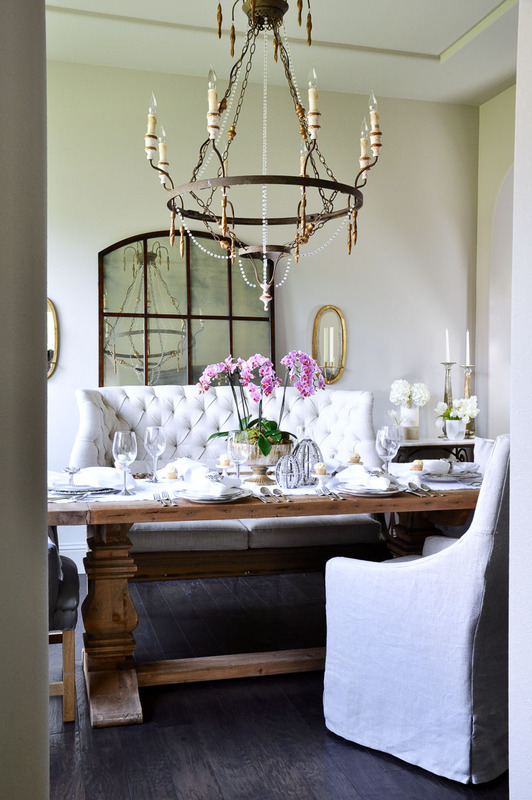 They also coordinate well with the gold candle sconces and gold accents on my chandelier. 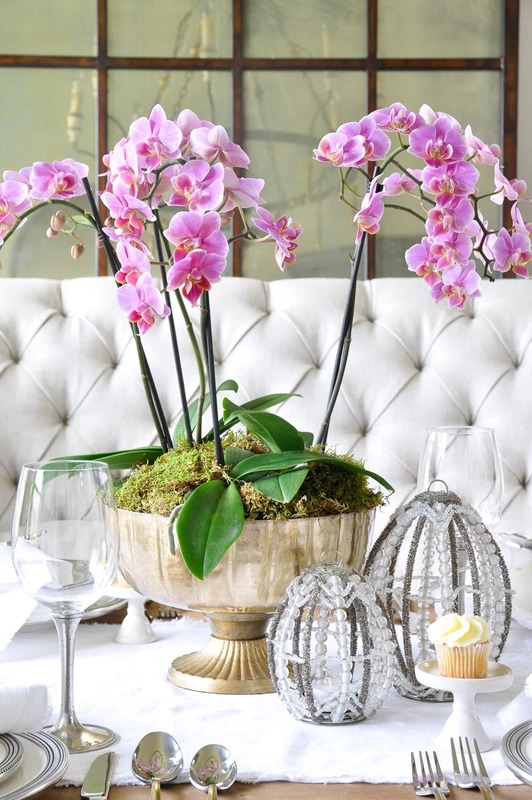 Next to the orchid arrangement are some darling beaded eggs. I’ve had mine for several years and I was thrilled to see them back in stock this year. 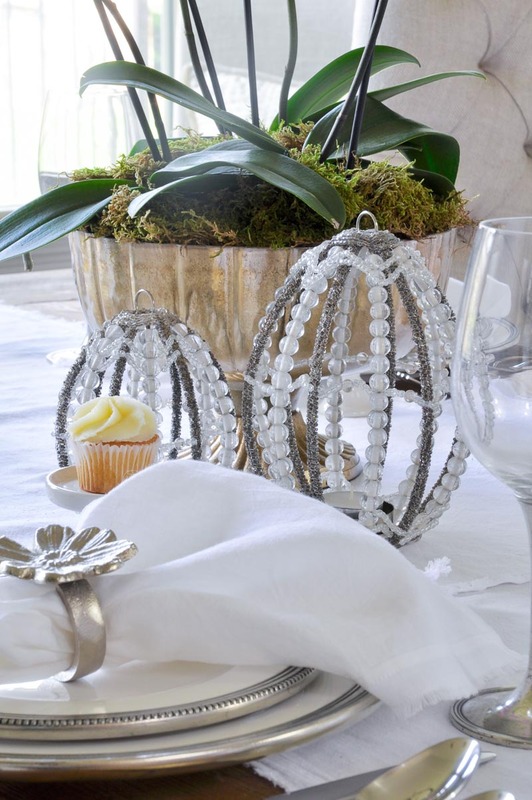 They offer the perfect subtle reminder that this table is an Easter setting. You can see how I used them in the past here and here. 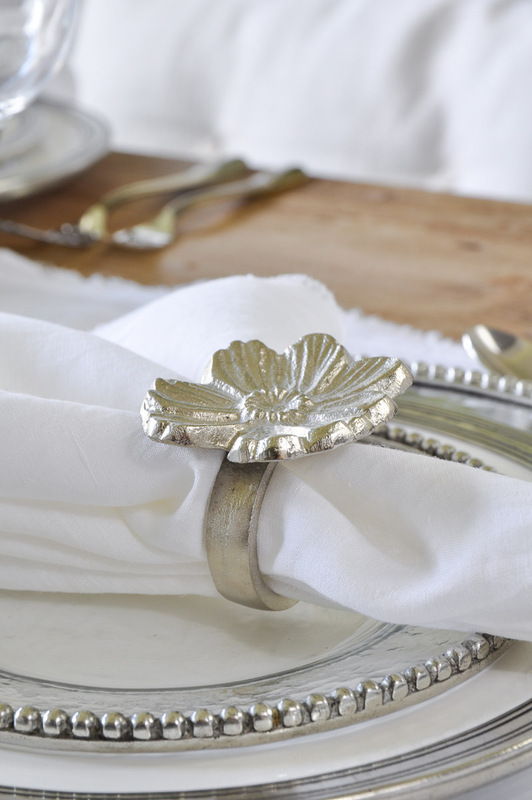 The cute flower napkin rings are new. 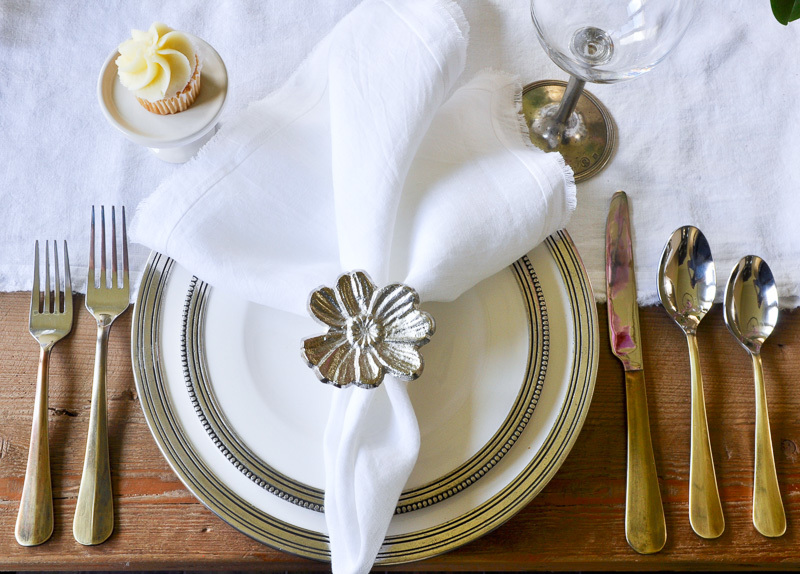 White dinnerware, pewter stemmed glassware, white linens and runner never disappoint. (You will find links to the dinnerware and stemware below). Click any image to shop. You can also scroll for additional items. Click any image to shop my dining room. You can also scroll for additional items. 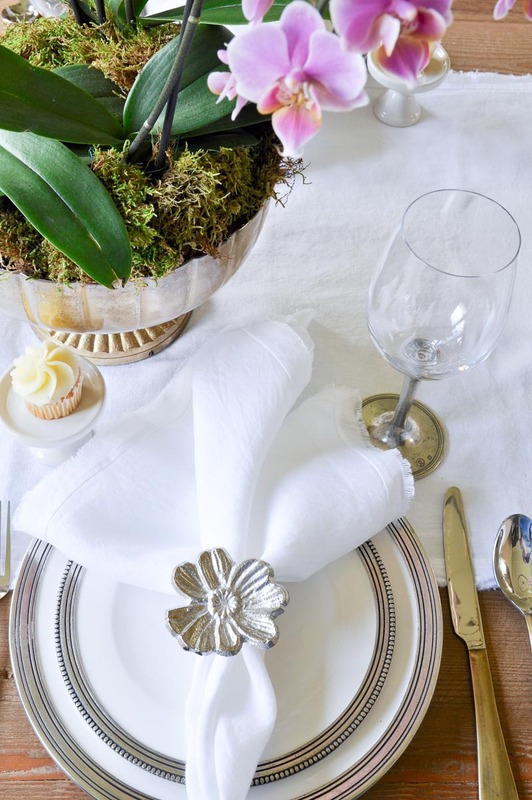 Easter is one of my favorite holidays and it is always a pleasure to create a tablescape for this special day. I hope you’ve enjoyed it. Happy Easter to you and yours! 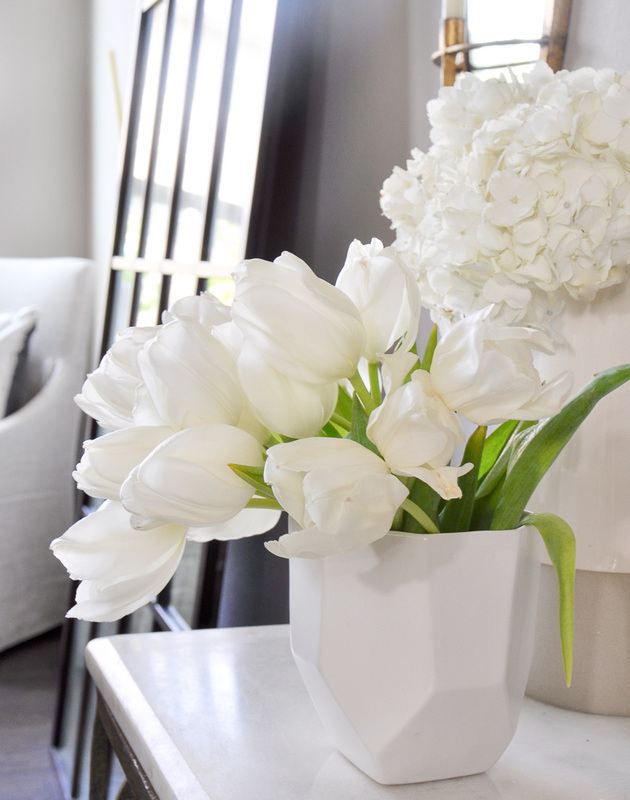 I’d love for you to take a moment to tour my home for additional spring ideas! Now, please continue to CitrineLiving. Tamara is such an amazing stylist and designer. I know you will love her blog as much as I do! Jennifer, your table is so stunning! 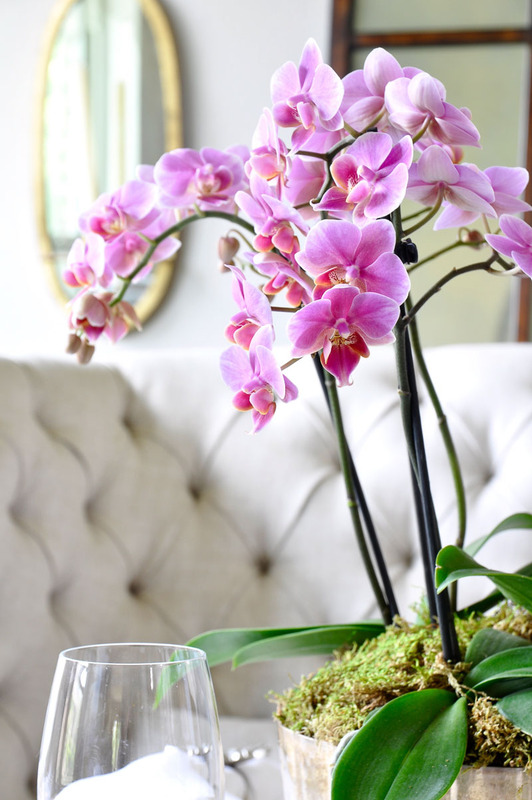 The orchids alone, set against the backdrop of that gorgeous settee are enough of beautiful statement, but then when you add in all the glimmery touches it really knocks it out of the park!! Wonderful! Thank you Lory! You are so kind to host us again! Happy Easter to you!!! What a lovely table ! The centerpiece is my favorite! I adore orchids. Thanks so much Kim! I adore them too!!! Jennifer, your table is gorgeous. 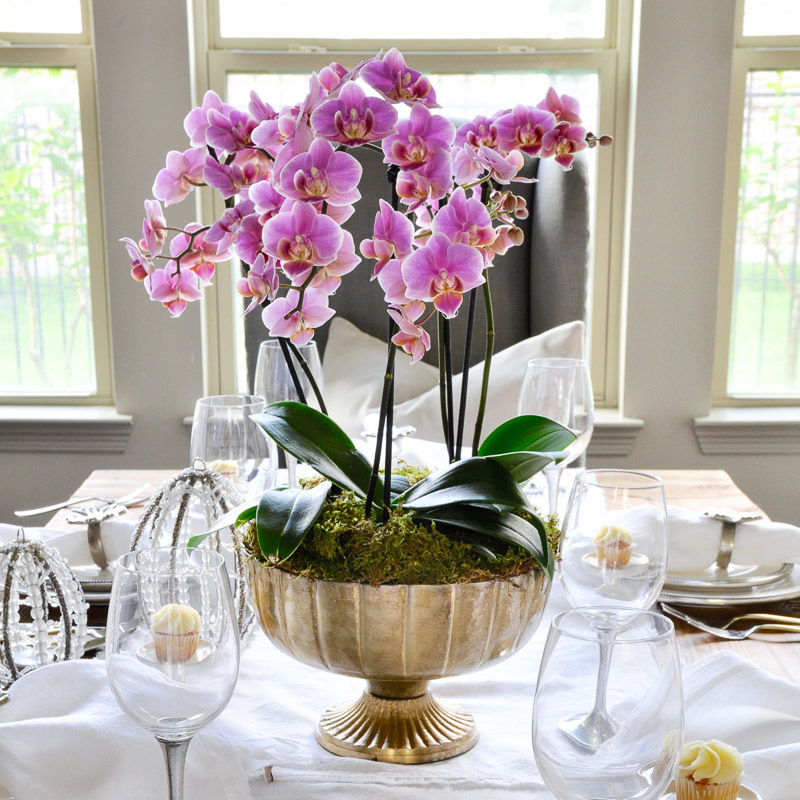 Perfect for the season, the bright orchids add just the right pop of color to infuse your tablesetting with spring elegance. I am excited to be on this Styled + Set Tour with you today. Jen, this is so elegant, I love it! 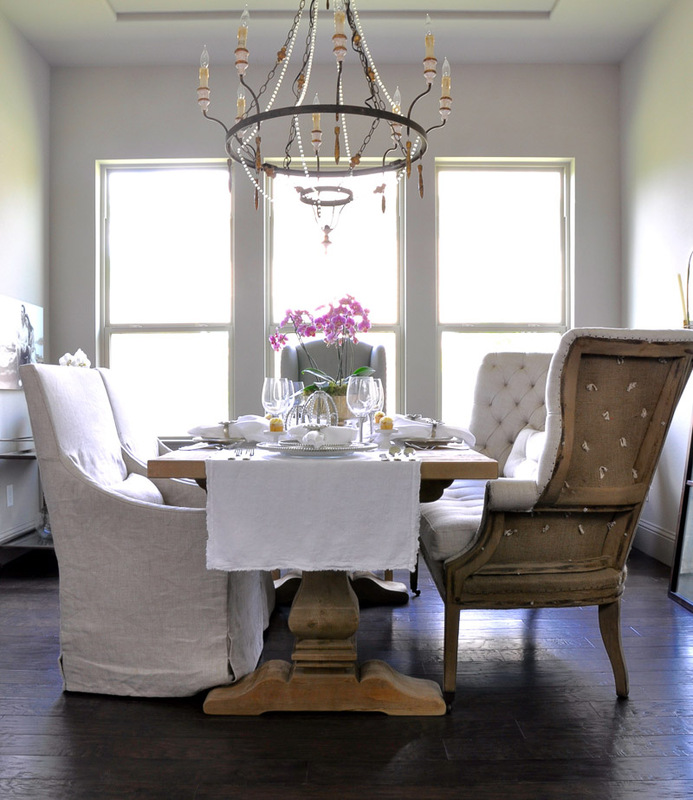 What gorgeous shots and angles of your dining room too! 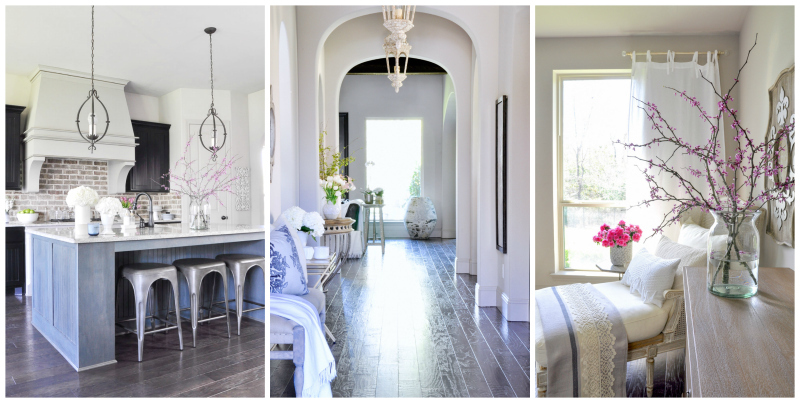 Love your home and style so much my friend! You do??? Oh my goodness! Then you know where I found it and why I was looking for golden eggs! LOL. Thanks for stopping by and for your kind words. Thanks so much Kel! I love them! Thank you so much Randi! Love you my friend!